Well, I pulled the trigger today. 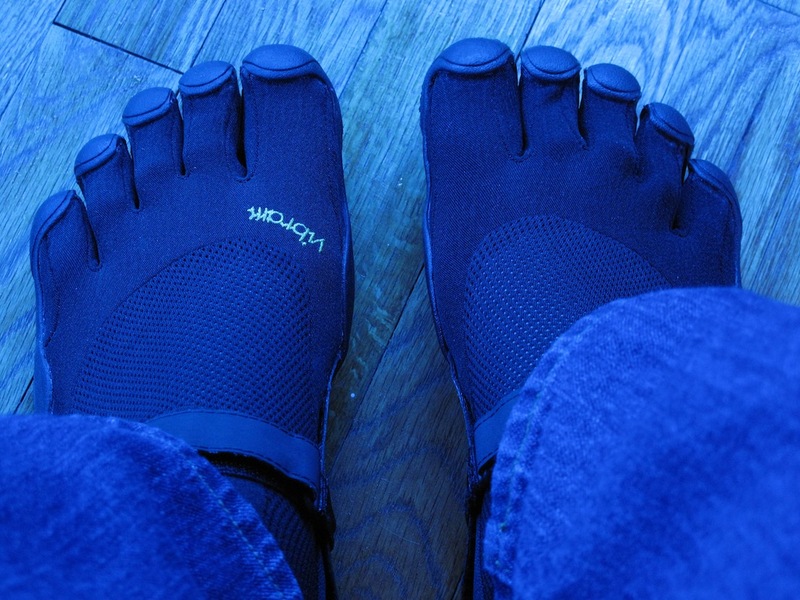 I found a store in the city that carries Vibram Five Finger shoes. I was unsure if I should order them online because I have big feet (size 14.5) and their sizing is unconventional. I believe the sizing is based on the european metric system. My right foot is a little smaller so I bought two different sizes for a better fit. They fit very well and I kept them on since I left the store so I can get used to them. My feet are feeling some what tired and sore. I was expecting that after doing a vast amount of research on them before the purchase. Basically when you start running around barefoot which is what you are basically doing, you are using a lot of muscles that you haven’t used in a long time. I will give them a couple of days of use before I chime in with my verdict. When I do give my verdict it will be via an update on this post. I’m interested in what you think of them in a few weeks. I’ve thought about them because I have wide feet and until recently it’s been tough to find comfortable shoes. I’ve also wondered if shoes cause more problems than they solve. I’ve hiked up hilly and rocky trails wearing only sandals and it felt better than boots because it let my feet do the work they were made for. If you have a 14 and found one that works I am very interested in what you bought. They feel great and I really look forward to wearing them. If I could get away wearing them to my client locations I would. I have one Insurance firm that actually knew I bought them and said they wouldn’t mind me wearing them in the office. I have had no issues with them at all. I was a little concerned because I have a little bit of a claw on two of my toes due to nerve damage in my right foot from surgeries as a kid. It is slight clawing and I am doing exercises to help with that. I actually feel the shoe helps that because the toes get to move as they don’t do in a conventional shoe. I would recommending them though if you have severe clawing or hammer toe. As far a sizing I have two different size feet again from surgery as a child which stunted the growth in my right foot. I wound up by two pairs a 47 and a 46. The place I went to had a special measuring device that was dead on. If you buy them make sure that your toes are not bumping at the end of the shoe and you are good to go. BTW, I loved them so much I dragged my wife into the city to buy a pair for herself. She loves them and wears them a lot. She is lucky she is double jointed in her toes so she can do some pretty funky things with them. It is really easy for her to put them on even for the first time. Don’t be put off if it is hard to put them on the first couple of times it was for me but it is easy now. Also the first couple of days using them your feet will be sore. You are not used to walking all over town barefoot. You will get used to it quickly, I did. The sizing isn’t even European … I’d call it just proprietary to the Vibram Five Fingers line. 14.5 — Those are big feet! Yeah they are big happy feet now. I just visited the Birthday Shoes site you linked to, it is a great site and very informative. Is this your site?